Has consumer behaviour changed this December especially with the impact of on line sales? What was the pattern of trading across the second half of December 2018. In this analysis Kepler will analyse the trends and daily variations to provide retailers with a view of overall Australian retail sales performance in December 2018 and seek to identify the sales drivers which most affected this performance. Black Friday 2018 is upon us, and this can only mean that retailers have offered discounts and promotions both in their online and physical stores. We therefore expect a spike in customer traffic, both in and out of the store, and also a big jump in sales for that special shopping date alone. However, what else can we understand from this shopping phenomenon? To deeper understand the consequences of such an event, we will explore and compare the metrics of Inside traffic, Outside traffic, Shopfront Conversion, Dwell Time, Returning Visits, Sales, Total Sales and Average Transaction Value against all relevant historical data (24/09/2018 – 18/11/2018) and relate to how a store is performing on Black Friday 2018 and the week (19/11/2018 – 25/11/2018) itself. According to Black-Friday.Global (Black Friday in Australia 2018), around 56.6% of consumers will look for deals on both online and brick-and-mortar stores, while only 37.1% and 6.3% will only look for deals online and offline respectively. With the advent of such an increasingly competitive online market, we determine whether a store with an online shop will experience a boost in sales similar to one without. Location, location, location; one is never wrong to assume that location plays an important role in determining how an event will pan out. As such, we have further classified all the Australian stores into its respective states and we have come up with some interesting findings. All Shopping Centres and Outlet stores seem to benefit the most, with the greatest increase in traffic (~43.9%), Sales (~119.0%) and Total Sales (~124.2%). In spite of sales pricing, the Average Transaction Value increased by a small percentage (~2.3%) showing an increase in basket size. Big Shopping Centres (10 biggest Australian shopping malls which includes Chadstone, Westfield Fountain Gate and Westfield Sydney) did much better than their smaller counterparts. Outlet stores are much better than the Shopping Centres in terms of Average Transaction Value, which suggests that outlet retailers and this again mirrors the week of Boxing Day where shoppers have the propensity of shopping the deal. Retail Park Stores could do better in converting increased Outside traffic to actual customers. Suffers from competition from bigger shopping places with lower Returning Visits. Hypothesize that increased Outside traffic is due to new customers who are aware of sale event but live too far from major shopping centres/outlets (4.19%) and an increase in Dwell Time suggests customers have no plans on going somewhere else soon. Also suffers from competition from bigger shopping places with lower Returning Visits. Street stores are not very successful in converting Outside traffic to actual customers (a drop of 5.6% in Shopfront Conversion) and this is again consistent with the week of Boxing Day where consumers visit a centre to shop the deal. Standalone stores suffer from the lowest increase in traffic (only 8.4%) and a big drop in Returning Visits (24.0%), which is understandable given the lack of variety in goods and services. If we compare Google Trends for each state regarding Black Friday 2018 (Bar chart to the right), we can see that there are some states that are more interested in the shopping event compared to the others (VIC being the most interested and TAS being the least). 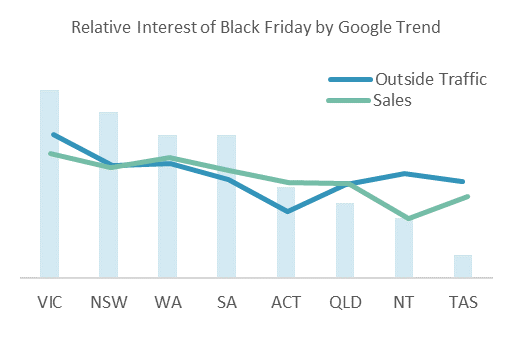 Therefore, we will analyse whether such an interest necessarily results in increased traffic and hence sales.If we compare Google Trends for each state regarding Black Friday 2018 (Bar chart to the right), we can see that there are some states that are more interested in the shopping event compared to the others (VIC being the most interested and TAS being the least). Therefore, we will analyse whether such an interest necessarily results in increased traffic and hence sales. Google Trend can give some indications in terms of Sales and Outside traffic pattern for each state. 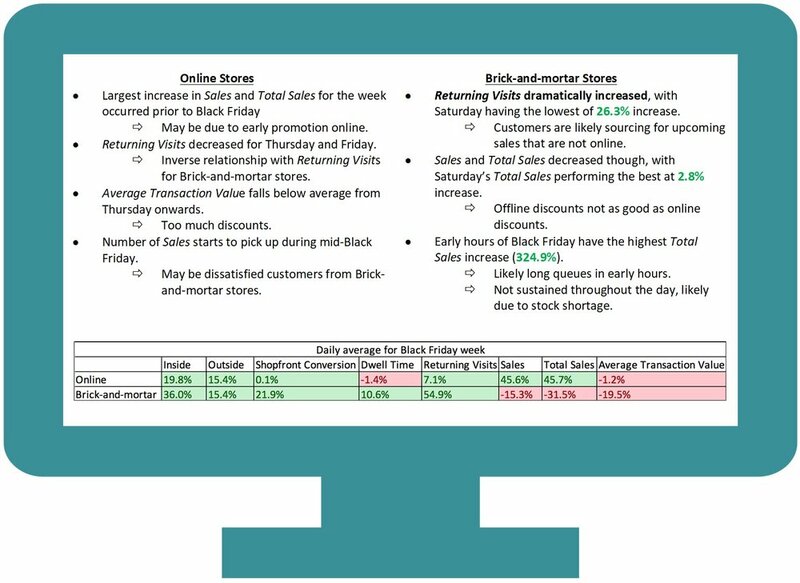 As we look into the data for each state during the Black Friday week, there is an apparent similarity in terms of the customer behaviour for Monday – Thursday. However, for Friday – Sunday, some customers from certain states behave in a rather unusual manner. When analysing the Sales and Total Sales metrics, there is a dramatic percentage increase for all states, with VIC stores doing the best at 76.4% and NT stores doing the worst at a respectable 58.1% (Note that this takes into account of the number of stores we have in each state). However, Average Transaction Value for all states are negative for the weekend after Black Friday, with SA and NSW stores even registering negative values on Black Friday too. Shoppers are very receptive to the discounting and promotions. Interesting to note that, based on the targets we received from retailers were and the actual sales achieved, retailers were expecting a greater percentage increase of Total Sales over Sales (41.8% more) during this sale period. Returning Visits generally only increase from Friday onwards, but NSW stores experienced a positive Returning Visits percentage increase throughout the week, with a daily percentage increase averaging 21.6%. Comparing to targets, SA stores are an anomaly, as they are the only ones that did not meet any Total Sales target for Black Friday week. 75.0% of all stores met their Sales target for Thursday – Sunday, but only 31.6% of all stores met their Total Sales target for the same time period. ACT, VIC and TAS stores did the best in meeting their weekly targets (2 out of 7 days for Total Sales and 4 out of 7 days for Sales), while QLD stores did the worst (1 out of 7 days for Total Sales and 1 out of 7 days for Sales). Kepler Retail Radar was prepared by Miley He, Lead Data Scientist at Kepler Analytics. Are Shopping Centre VIP Events Letting Retailers Down? • Shopping centres are using VIP events to boost foot traffic and sales conversion rates. • Not all retailers benefit from VIP events. • The Kepler Retail Radar attempts to use data to answer the question on many retailers’ minds: Are VIP events providing additional sales above those of a standard day and week? In our previous Retail Radar (edition April 2017), we made a twofold Mother’s Day 2017 prediction. After reviewing the data, we are pleased to announce that our predictions were accurate. Retailers have always had sales data to measure the impact of ANZAC Day and Mother’s Day on store performance. However, we were able to gain additional insights into customer behaviour by observing industry level foot traffic data (specialty retail sector in Australia) on the days leading up to these public holidays. Many people think of big data as lots of data that is collected by large companies to spy on people. They think of it as this new technology that is slowly revolutionising the way we do business. Big data is not as simple as numbers that businesses are collecting. As the retail landscape in both the digital and physical worlds change, the goal of business owners is to increasingly improve services for their customers. Data and analytics have become more and more important. Sometimes the numbers can be overwhelming, but we continue to ask for more. The key to improving any business is to benchmark and then continuously improve. At Kepler Analytics, we strongly believe in the power of data-driven decision making. The e-commerce market has had the luxury of customer behavioural data for decades when it only commands 5% of all retail spending. So it’s mind-boggling to think that, while 95% of all spending is still done at brick-and-mortar stores, there is no reliable and effective method to measure in-store customer behaviour at all!